After an earthshaking and wholly unexpected record-breaking performance, summer looks to be right back on track (though of course it remains a series of unconnected semi-random events. But that's no fun for punditry!). A return of a critical-acclaim factory studio to the summer should make for a fairly gaudy figure overall for this weekend. After taking 2014 off from releasing films, Pixar returns with its 15th full length feature (and its first of two this year), Inside Out. Set mostly within the mind of a 12-year-old girl, it anthropomorphizes the emotions in her head, giving us a peek into what makes her tick – a brilliant original concept, if you never watched the late '90s sitcom Herman's Head. Okay, so it's the execution, not the idea, and Pixar are experts at taking ideas that shouldn't work and turning them into magic. Rapturous reviews show they've once again pulled it off. Following a move from the midwest to San Francisco, Riley, the main character in charge (sort of) of these emotions, struggles with adapting to her new life. A mix of Joy, Sadness, Fear, Disgust and Anger run the controls, and we get a look at how each of them interact with all the new situations and people, along with the real enemies – mom and dad (and their own emotions, too). Reviews have focused on the clever interplay of the inner mind and the outside world, as well as the bright and sparking voice performances (including Amy Poehler, Bill Hader, Lewis Black, Mindy Kaling and Phyllis Smith). All evidence points to this being another winner on all fronts for Pixar. As successful as Pixar has continually been, they've rarely hit the mega-opener mark, with only Toy Story 3 hitting the $100 million mark for an opening weekend. For the most part they've stuck in a comfortable $60-70 million range, although with the two year gap between their most recent films,we're possibly going to get a decent look at how the market has changed. 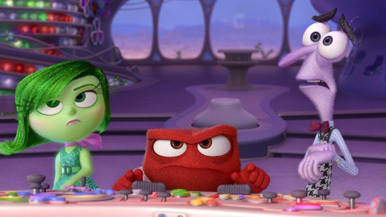 Original projects have suffered quite a bit this summer relative to known franchises (we'll get to one of those in a bit), and may be leaving some a little gun shy, but with the universal praise that Inside Out is receiving, this feels like the film to break that pattern. While it faces a monster of a returning film that will keep it from claiming top spot, it'll have to settle for being the highest opening film that didn't reach #1, potentially breaking the 11-year-old record held by The Day After Tomorrow, with around $73 million.